Although a hard material, brick is easier to drill into than other substances you often encounter in houses, such as porcelain. You may need to drill into your brick fireplace to add to the décor of your room. Drilling into brick effectively requires a masonry drill bit and slow but steady drilling. As long as you avoid overheating the drill, you shouldn’t encounter any problems. 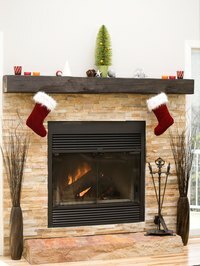 Create an X on the fireplace with masking tape, with the middle of the X the spot where you will begin drilling. While you can make an X with a pencil, you may not want to draw on your brick. Secure a masonry drill bit into your drill. To determine the size of the bit, line up the shank of the screw with the bit. The shank should appear slightly smaller than the drill bit. Press the drill against the brick. Do not place it in the mortar. Mortar is weak, will likely flake off and may not hold a great deal of weight. Set the drill to a slow speed. Press your shoulder into the back of the drill and begin drilling. You’ll need a good amount of force to drill through the brick, but don’t press all your weight on the drill; that may cause the bit to slip out of position. Drill for a maximum of 20 seconds at a time, until you get through the brick. After 20 seconds, remove the drill bit from the brick and dip it in cold water to keep the drill cool. Dry off the drill bit and begin drilling again if needed. Do not use a hammer drill; use a standard drill. While a hammer drill will allow you to get through the brick faster, it may also cause the brick to crack, especially if the brick is old.